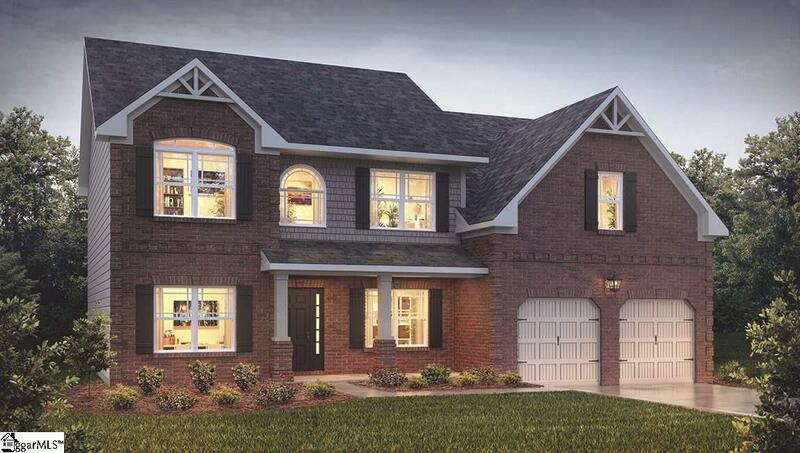 Come check out the Ryan, one of our most popular floorplans, in the exclusive new community, Kings Crossing!!! Ready March 2019. There is a full bath and bedroom on the Main level. The Master Bedroom and 3 additional bedrooms are on the second floor. The Master and one other bedroom have their own bath in the bedroom. The other two bedrooms share a popular Jack and Jill style bath. There is an office, den or Living Room area as you enter and a beautiful Dining Room that has a Coffered Ceiling with extensive Trim. The Kitchen and Great Room are open to each other and if you don't like the staircase facing you when you walk in your entry, well... here it is... a beautiful, angled Staircase hidden from view. The only thing you will see is the dramatic double Story Entry. To top it all off this home has a Media/Bonus room!! Hardwoods, stainless steel appliances, gourmet kitchen and fully sodded and irrigation systems are included. Located Minutes from downtown Simpsonville, Woodruff Rd, I-385, and Fox Run Country Club. With top rated schools and estate sized home sites, whats not to love? Must use builders contract. Prices and options are subject to change without notice. Listing provided courtesy of Michael Mckeel of D.R. Horton.